The facts that are contained in this book about the real Michel de Nostradame bear little resemblance to the myth that has grown up around him over the last five centuries. Our modern concepts about the life and times of Nostradamus are clearly inaccurate. Peter Lemesurier, a recognised scholar who has had 10 books about the seer published, does a demolition job on most of our modern misconceptions. Far from being some kind of talented mystical seer, Nostradamus was a second-rate astrologer who based his almanacs and sets of prophecies upon previous literary texts. Somehow, he became the most famous seer in history. 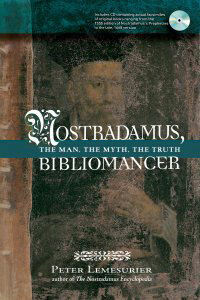 The cover of 'Nostradamus, Bibliomancer' has an antiquated, scholastic style to it. It is certainly the most informed and scholarly work I have read on the subject. The author, a Cambridge alumnus and professional linguist, is exceedingly well qualified to translate the original 16th Century texts from the original French. Most of the book is taken up with his most recent translation of "The Prophecies" by Nostradamus, in its entirety. This, in itself, makes the book a good investment. But, additionally, the book comes with a CD containing 954 facsimiles of the Frenchman's books and almanacs. To a non-French speaker, this might not be of much use. However, as most of the so-called experts on Nostradamus are not themselves French speakers, the author effectively makes the point that he has studied this work in considerable professional detail. That provides this book with an air of professional authority that others surely lack. But it is in his 80 page preface to the translations that the real meat of Lemesurier's thesis is contained. He provides a delightfully disrespectful biography of the seer, and shows that the man's reputation is woefully ill-founded. Far from being a renowned doctor, Nostradamus was a plague-resistant quack whose apparent mastery over this terrible disease owed much to the natural culmination of plague breakouts: burn-out. He was certainly an apothecary by trade - an equivalent in his day to a travelling pharmacist. But his brief association with medical school in his youth led to an assumption among his peers that he was really a qualified physician. This inaccurate assumption formed when his nationwide reputation as a psychic astrologer was building. He allowed this reputation to flourish, as any charlatan would, when in reality the only doctorly thing about him was his appalling handwriting. Having successfully exposed Nostradamus for being a quack, Lemesurier (who was once something of a fan of the French seer) shows how his actual prophecies are remarkably inaccurate. For hundreds of years, many authors and commentators have read all kinds of things into the prophecies of Nostradamus. Even the more famous predictions are inaccurate, however. The work has been mis-translated and misrepresented many times by wishful thinkers, always retrospectively. In truth, the vague quartets allude to an entirely different body of knowledge than the myths that have grown up around Nostradamus indicate. Lemesurier demonstrates that Nostradamus used a technique called "bibliomancy". He randomly chose passages from old books and used them as the basis for future events. It seems that he believed in a system of planetary ages, that would repeat periodically. Effectively, history repeats itself, and by learning the astrological systems involved, a seer could predict future events based upon historical records. The system used by Nostradamus seems to have been devilishly complex, but a system it was, rather than some kind of remote viewing or related clairvoyance. This is powerful stuff, but it also gives those with a more standard view of Nostradamus some hope. For Lemesurier to be right, then Nostradamus was a fraudster as well as incompetent astrologer and bogus doctor. Many will not accept this, and will balk at such an overt character assassination. But I think the sceptical case levelled against the 16th century seer by Lemesurier is a remarkably strong one. If you are interested in the truth about Nostradamus, based upon real historical records and professional translations of his work, then you will find this a fascinating and compelling book. It shatters many myths, and casts the seer into an altogether different light from the one generally peddled in the media. Subtitled "The Man, The Myth, The Truth"